Nitrogen dioxide, from cars and power plant emissions, may influence food-seeking behavior, a USC study suggests. 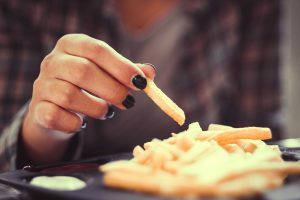 A new USC study suggests that exposure to traffic pollution during childhood makes adolescents 34 percent more likely to eat foods high in unhealthy trans fats – regardless of household income, parent education level or proximity to fast food restaurants. The findings appear in the American Journal of Clinical Nutrition. For the current study, researchers used data from 3,100 school-age children who were enrolled in the USC Children’s Health Study during 1993-1994 and followed for four to eight years. The USC Children’s Health Study, which began in 1992 and is ongoing, is one of the largest and most detailed studies of the long-term effects of air pollution on the respiratory health of children. Eight of the USA’s 10 most-polluted cities, in terms of ozone pollution, are in California, according to the American Lung Association’s annual “State of the Air” report for 2018. Researchers collected yearly diet information with a 131-item questionnaire that asked participants how frequently they consumed certain foods, from “less than once per month” to “2 or more servings per day.” Participants also reported how often they ate dinner prepared away from home. Researchers took into account – and used statistical methods to remove – factors such as parental education level, household income of each child participant, the number of fast food restaurants within a 500-meter buffer zone near school and home, community-level poverty rates and low education rates. The percentage of children and adolescents in the United States affected by obesity has more than tripled since the 1970s, according to the U.S. Centers for Disease Control and Prevention. Data from 2015-2016 show that nearly 1 in 5 school age children and young people (6 to 19 years) in the country are obese. Obesity increases risk for asthma, diabetes, bone and joint problems, cancer and heart disease. In addition to Chen, the study’s authors are Frank Gilliland (senior author and principal investigator of the Children’s Health Study), Megan Herting, Leda Chatzi, Britni Belcher and Rob McConnell, all of USC; and Tanya Alderete of the University of Colorado at Boulder. Photo caption: A USC study found that exposure to traffic pollution during childhood makes adolescents more likely to eat foods high in unhealthy trans fats.